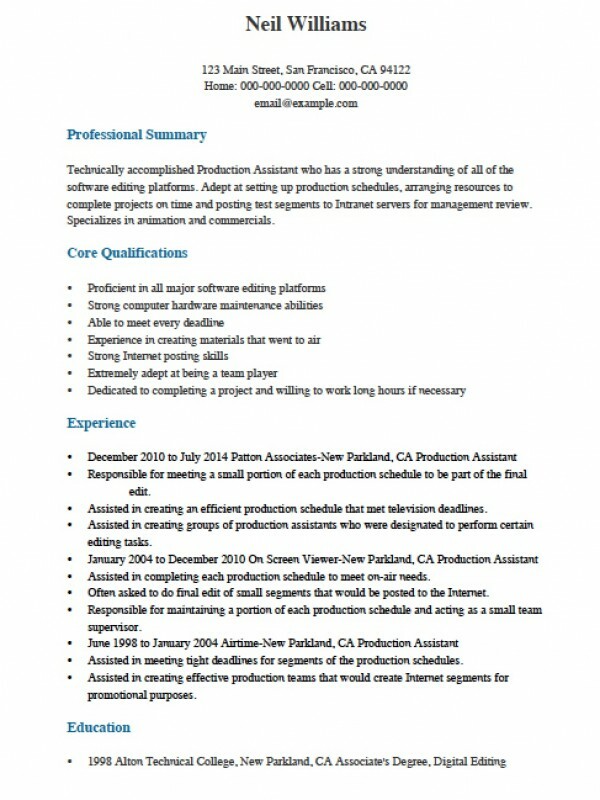 The professional production assistant resume template is a document that may be used for an individual that is seeking to hold a high-level position on a film project for television a movie. The person should have at least four (4) years experience or have at least ten (10) projects that they have worked on to claim the title of a professional or of having a high level of experience as a production assistant. The resume should have a brief description of every position held during the person’s career along with references (if needed). Step 1 – To start, enter the name of the individual at the top of the page including their contact details such as Address, Telephone, and Email. Step 2 – Include the Professional Summary, also known as the ‘Objective’, to inform the production company or team of your exact specifications and the role you would be looking for in any new project. Step 3 – The following field should include your qualifications such as your most suitable skills. Example: audio/sound, camera-work, film scheduling, video editing, etc. Step 4 – List all your experiences and past projects that you have been apart of and the dates for when it started and ended. Include any names of the project, for example, if it is a well-known television show or movie and the individuals (if notable) that you worked along side. Step 5 – If you feel it is necessary list the education along with any associations or organizations that you are a member.